Current minister of culture, gender, entertainment and sport; and the longest serving sitting female member of Parliament in Jamaica, Olivia Grange has a long and illustrious career in politics. Among her achievements are being crowned CARICOM’s first Champion for Culture in 2009; being a founding member of the Jamaica Association of Composers, Authors and Publishers (JACAP); being awarded the Order of Distinction, in the rank of Commander (CD), for her contribution to the Jamaican Music Industry, Cultural Development and Public Service in 2015; and cofounding Contrast, Canada’s first black community newspaper. 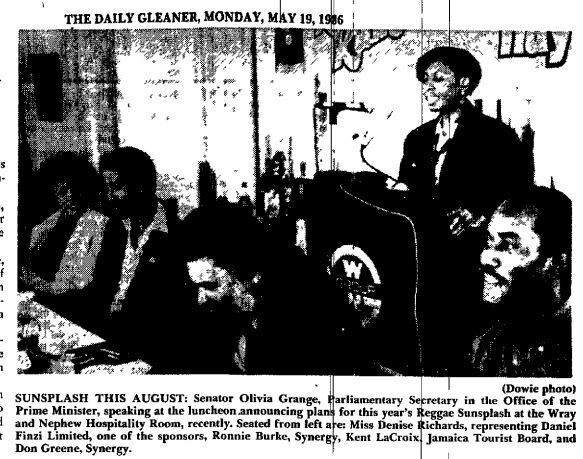 For Throwback Thursday, we look all the way back to 1986, when she was parliamentary secretary in the Office of the Prime Minister, announcing plans at the launch of that year’s staging of Reggae Sunsplash. Enjoy the photo bite! Photo courtesy of The Gleaner Newspaper Archives.